Heads up: That’s Guy Martino of Kennedy High in Cedar Rapids, playing in the Iowa state tourney (with thanks to Jesse Gavin, who also notes that Martino’s teammate Eric Schultz wears tights and that the Bishop Heelan team wears “Pride” on their jerseys, instead of player names). Florida is STILL NOT wearing their new uniforms. Whats up with that? Maybe the players don’t like? New Era has a preview page for the 5950’s up. What’s with the 3rd Padres cap, is that new? I’ve never seen that before. [quote comment=”61006″]New Era has a preview page for the 5950’s up. I’m guessing that’s for when they wear their camo jerseys. Wait…here’s one. I thought the Reds were ditching the black hats. I even referenced Paul’s write-up of the new unis from December. No black hat. [quote comment=”61010″][quote comment=”61006″]New Era has a preview page for the 5950’s up. I think that’s awesome having a picture with all the caps together. The Twins need to wear these more. [quote comment=”61011″][quote comment=”61006″]New Era has a preview page for the 5950’s up. It still exists as some sort of Alternate hat, but they have never modeled them with any of their new uniforms, so I have no idea when they plan on using them. [quote comment=”61015″][quote comment=”61011″][quote comment=”61006″]New Era has a preview page for the 5950’s up. Paul–Bishop Heelan is a Catholic school in the Sioux City district. I lived in the area until I was 13, and ALL of their sports wear “PRIDE” on the back of their uniforms. They believe in the “Play for the name on the front of your jersey, not the one on the back” philosophy, and also play for pride. I think their official nickname is the Crusaders, but they’re usually known as the Pride. Some teams looks good with having different home and road caps; some teams look ridiculous with three hats; however, I like the fact that the Phillies use the “star” cap just for interleague games. 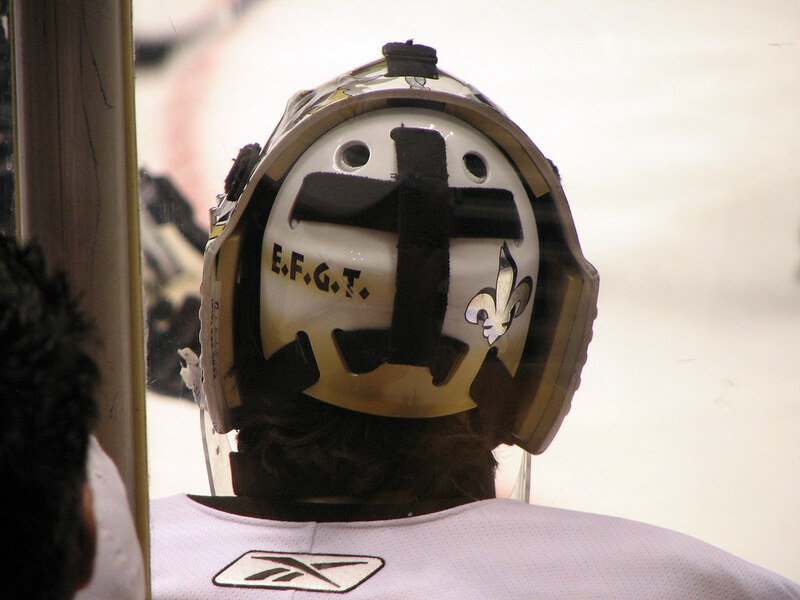 Just to follow up on a comment way back in December about Marc-Andre Fleury’s helmet, I was able to get a picture of the “E.F.G.T” and the fleur de leis on the back. The letters stand for the first initials of his deceased grandparents: Estelle, Francois, Gaston and Therese. [quote comment=”61001″]Florida is STILL NOT wearing their new uniforms. Whats up with that? Maybe the players don’t like? I think it’s because the one time they wore them, at Tennessee, they lost. Also when they went back to the usual uni’s, they rolled through the SEC Tournament. the greens look so good for the Sox. I wouldn’t mind them being used as an alt instead of the kool-aid jerseys. I also like that touch by the Phillies. The Cardinals only wear their 3rd cap for Sunday home day games. There is no guessing what you’ll see when you show up to the ballpark. The Red Sox are in their green uniforms today (obviously) playing the Reds. Also, the bases have been painted green. well, the A’s are right down the street from me (almost) and I can’t recall the last time I saw those black hats. I wish Texas would wear those red T hats, since their logo has a red T. Use the white T hats for away games, and scrap the black billed hats since black is nowhere in the team’s logo. Tampa Bay should scrap the all black hat (even though its my favorite of the 3) Use green at home and black/green bill on the road. I remember seeing alot of people wearing the black A’s hats when they came out (I live in Illinois) but they wore those on 02 or 03 only and havn’t been seen since…weird. Marketing idea: Baltimore scrap the O’s hat and have one with the cartoonish Oriole. I think it would be a hit ala Milwaukee’s reintroduction of the MB hat. Toronto get a blue hat. mlbstyleguide.com does have the show the Padres camoflauge jerseys and caps officially listed as an alternate home uniform… it’s a hideous design but a great gesture and if they limit the dates they wear to Memorial Day and 4th of July games, it’s a terrific idea. The PRIDE names on the back of the HS unis should be changed to LAME. Silly. Sophmoric. Lame. Green jerseys to commemorate Red Auerbach’s passing is a terrific gesture and speaks volumes for the classy Red Sox organization. I really like the black A’s hat, but then again, I like black and dark green, so it’s kind of expected. I’m curious about the home and road Padres caps. Are they identical? One looks a little lighter and fuzzier, but that’s hardly enough to merit two separate caps, right??? I’d be happy if Toronto got a blue anything. It’s in their freaking name, for crying out loud. I don’t think the Twins need to wear the red top caps ever again. When I see them I think of Rob Wilfong-era ineptitude. The Cardinals will follow the Red Sox and White Sox in Opening Day Championship jerseys and hats. [quote comment=”61036″]I really like the black A’s hat, but then again, I like black and dark green, so it’s kind of expected. I think the “SD” on the middle hat is outline in gold while the other one is just white. I think, since that cap is olive green, that it might be the cap they plan on wearing with their camo jerseys, rather than the navy that they usually wear with it. To clarify on the three Padres hats. Padres wear camoflouge uniforms once a year to honor all the military in San Diego. This year military opening day is 4/7. I’m going to the game, and might buy one of the green caps. It’d be nice if proceeds from sales of all the camoflouge merchandise went to a charity/cause benefitting military families. [quote comment=”61018″]Paul–Bishop Heelan is a Catholic school in the Sioux City district. I lived in the area until I was 13, and ALL of their sports wear “PRIDE” on the back of their uniforms. 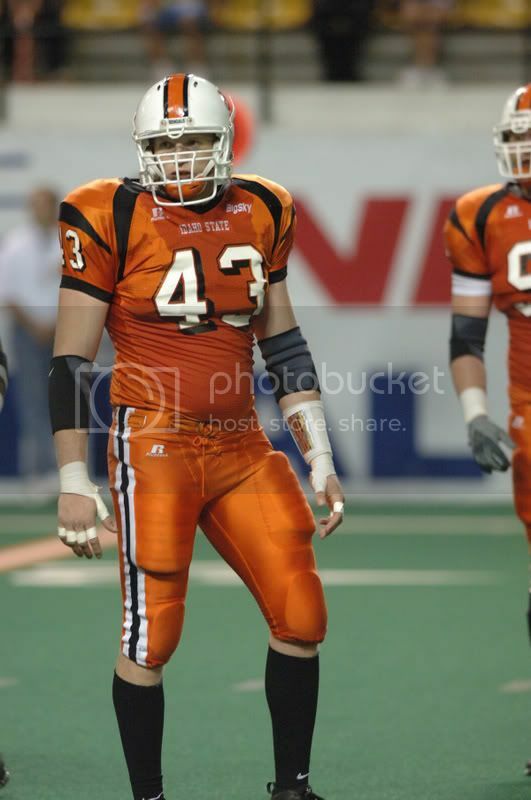 I live in Sioux City, IA and coach football for the crosstown rival of the Heelan Crusaders, the East Black Raiders. The “PRIDE” thing goes back as far as I can remember but I don’t recall anyone ever calling the team The Pride. They are most definately known as the Crusaders. [quote comment=”61048″]To clarify on the three Padres hats. It would be fitting if they let their knew pitcher who served in the Marines pitch in the game. But I believe he’ll be in the minor leagues for a few years, but atleast let him throw out the first pitch. [quote comment=”61042″][quote comment=”61036″]I really like the black A’s hat, but then again, I like black and dark green, so it’s kind of expected. The road Padres hat has gold lettering with a thin white border. I am watching the Ohio State-Xavier game and can’t help noticing that the RUPP ARENA court logo looks strikingly like the PHILIPS ARENA logo in Atlanta. For most of you who have never seen a Hawks home game on television (for good reason), the Philips logo looks like this. Oh, and the Nike System of Dress unis, like Ohio State’s, make anyone wearing them look like dinner bells. …and when I say dinner bell, I mean one of this variety, and not this type. I say that now, but there will probably be a day when Nike will decide to outfit our nation’s finest basketball programs with something similar to this. Mets in Spring Training – wearing green caps with orange bills. Shamrock on left side. Pedro Feliciano pitched the top of sixth with an ADJUSTABLE BACK green Mets cap!!! WTF!!!! They wore black jerseys to go along with the black cap. This look did not last long, I think it only lasted a season or two in the early 2000’s. About the comments about the orange shamrock and being offensive, look what I found. the Mets incorporated all of the Irish flag, orange and green, into the cap. No one has really complained. [quote comment=”61039″]The Cardinals will follow the Red Sox and White Sox in Opening Day Championship jerseys and hats. I read they were wearing those the whole season. Could be wrong bout that tho. Hey, did you guys notice that Green #10 for Butler has different typography on the back of his jersey? He has much bigger letters, and they appear to be like the kind you can find at a craft store. The Knicks rocked a green and orange look yesterday. Maybe it’s not such good luck to wear green on the day before St. Patrick’s Day. I thought it looked pretty bad. Appreciate the coverage of the Iowa Boy’s State Basketball Tournament! Cubs vs Padres. Green hats, ugh. White Sox are wearing green caps but they’re ADJUSTABLE!!! buy all the green here. The Mets used to have an ‘Irish Night’ promotion at home; I wonder if the players will wear the green caps that they hand out to the fans? Anybody else notice that Seattle seems to ghave dumped their classic navy-with-aqua-bill home cap and has only the all-navy one now? Liked the discontinued one myself. Still a good sign that a healthy 9 of 30 teams only use one cap and haven’t gone in for the merchandising-oriented alternates. Also, in the past I’ve complained about the excessively-low positioning of the numbers and player names on some of the newer jerseys, and now it’s spreading even to big guys like Barry Bonds. Here he actually has to untick his jersey a bit so that his number isn’t stuffed down the back of his pants! As an Indians fan, I am still upset that they went to the SMALLER WaHoo logo a couple of years back. The cap looks like a cheap dime store replica. Cubs are wearing pinstipes – thumbs up. They and the Padres are also wearing velcro, adjustable St. Pat’s caps – thumbs down! Cubs have the red “C” outlined in white, and the Padres’ have the swinging friar logo over a white shamrock. Judging by the sweat lines on Will Ohman’s cap, they are not made out of the “wicking” material. Bush league, New Era, bush league. Here are a couple of pictures from the Red Sox St. Patrick’s Day Game: Jonathan Papelbon sports a green jersey and cap and note the green base in the background. And Manny Ramirez was sans snood today. Also, thought it was interesting the Sox did not update the green jerseys and caps to this years models of spring training garb. Louisville just lost to A&M and if you ask me, the Cardinals need to ditch the black also. Those jerseys with the randomly placed white patches don’t look so great. [quote comment=”61088″]Here are a couple of pictures from the Red Sox St. Patrick’s Day Game: Jonathan Papelbon sports a green jersey and cap and note the green base in the background. And Manny Ramirez was sans snood today. The green jerseys were updated. They are alternate jerseys, not batting practice jerseys, and they have the correct Red Sox wordmark (not the fat round one shown in the logo, and on most replica jerseys). I agree. These jerseys are really awful. This picture isn’t the best example but watching Wisconsin yesterday the ‘lowered rear stripage’ made it look like guys were losing their pants. The effect was more pronounced on TV than it is in static photos. Why do the Red Sox have names on their green jerseys? They’re at [i]home[/i]. Nike World meets Fifth Third Bank! Scroll down to Comment #2…enjoy! Padres have switched from the camo hats to the solid green with brown “SD” logo hats. A bit of an improvement if you ask me. The camo hats were just embarassing. As far as the teams with more than one hat, I have no problem with them coming up with a road jersey hat – but the 3rd “alternate” jersey just rubs me the wrong way. At this point it just seems to be a blatant marketing scheme for the teams that have no idea how to sell hats. Oh well, it’s not like MLB ever listens to fan input anyway. As far as the A’s black hat – the last time I saw it worn was back when Giambi played for them – if that gives you any idea as to when it was last used. Not sure how many teams impliment this process, but I read a few years ago how the Diamondbacks allow the starting pitcher to select what jersey they will wear that evening. 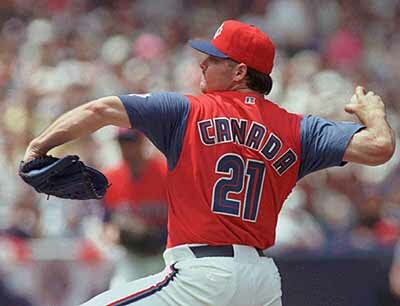 Obviously with the old Diamondbacks plethora of jersey combos (vest, solids, pinstripes, pinstripe vest, etc, etc.) they had a lot to choose from. Does anyone know or have heard of any other team that uses this system? Riding the El today in downtown Chicago for the Parade and found someone wearing this little diddy. Didn’t take a picture at that moment, but add 150 more pounds, a cup of beer and a floppy leprachaun hat and you’ll get the picture. OHL fans reside in Chicago. NICE JERSEY! I know the Cubs do this as well. The Cubs do for sure. Zambrano always wears the blue jerseys. When Maddux was with them he always wore pinstripes or gray. They should wear those more often. The Royals, too. Runelvys Hernandez (enjoy him, Red Sox fans!) used to always go with the darker colors, blue or black, to hide his flab. I don’t think I saw Mark Redman deviate from white or gray once. [quote comment=”61087″]Cubs are wearing pinstipes – thumbs up. Amen. You know … logo creep doesn’t bother me as much as it does some people. But for some reason, I really cannot stand to see the New Era logo on the side of their hats, and they slap it on everything that isn’t an authentic-collection 5950. That’s what bothers me most about the green hats. Michigan State vs North Carolina…is there a Spartan wearing sunglasses?? Sorry no pic but I was getting a quick score check between wrestling matches and saw a quick shot of someone with what looked like tinted glasses giving a high-five on the court. Not sure how many people have gotten a really good look at those new jerseys that Nike has Florida and OSU wearing, but Eastbay has the detailed shots that show some things I hadn’t noticed or actually seen earlier. First off, the Florida jersey has a scaled pattern on it and I have to say, it’s fairly interesting. Just thought a few of you might want to get a better look at it, computer generated or not. Secondly, I found it interesting that OSU is sporting the LBJ23 emblem instead of the normal swoosh or Jumpman logos. According to the SI article from a few weeks ago, they did this because it is where LeBron would’ve gone had he gone to college. The Jordan brand is used for UNC, but also with Cincy and Georgetown among other things. Does this mean we’ll soon be seeing the LBJ23 brand branching out in the same fashion? They’re both pretty insignificant and have been mentioned before probably, but things like this catch my interest. [quote comment=”61068″]The Knicks rocked a green and orange look yesterday. Appreciate the coverage of the Iowa Boy’s State Basketball Tournament! [/quote]I really hope the teal-like green is just because of the picture, because that’s horrid. Sorry for the double up. That would be Maurice Joseph. I don’t know why he’s wearing them, though. [quote comment=”61102″]Riding the El today in downtown Chicago for the Parade and found someone wearing this little diddy. Didn’t take a picture at that moment, but add 150 more pounds, a cup of beer and a floppy leprachaun hat and you’ll get the picture. Did anyone else notice that the jersey clearly has an RBK logo on the left shoulder, but the description to the left says “made in Canada by Team Nike”? Found a pic. Not a good one, but you can make out the Oakley logo. [quote comment=”61099″]Nike World meets Fifth Third Bank! Ah yes, I grew up in Cincinnati with 5/3. Bench used to do all their spots. But what’s with the blue/green? So for many years..oh, I’d say 1984 to about 2001, I wore nothing but Nike. Played a lot of tennis, and their shoes fit great. And for several years, I got all the free pairs I could handle. But around 01, I switched to Adidas. Well, my Adidas are worn out..and I CANNOT find a pair to fit right. I have normal feet..nothing strange. SO my wife suggested, “Try Nike again..didn’t they always fit great?” So we went to Kohl’s and I got two pair that felt like they were made for me. I need more of a life. I’m just waiting for the day when someone’s pant leg gets caught on a cleat and they faceplant. 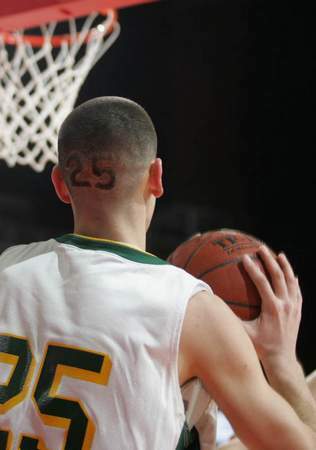 Article about Ryan Francis and the patch USC basketball wears to commemorate his death. Allison, the links work fine for me. I will laugh hysterically the day this happens—and it will. Paul, I was watching the MN Girls’ High School Basketball Tournament (interspersed with March Madness, of course), and I saw a guy wearing a Mets’ t-shirt. Orange, with a script Mets. As neither team is nicknamed the Mets, I can only assume he is a Mets’ fan, and, yes, I immediately thought of how you would be so happy there was nary a speck of black in sight. Hm. I, too, must stop reading this blog so much. Of course, the guy wearing the Mets’ shirt was in the stands and not in the game. Just thought I would clarify. OK thats the thing. For company logos, you can kinda get away with something like that, but that’s why I always support uniforms with simple contrasting color schemes, simple patterns, and big block lettering. Let me see what team you are or what number you are or what your name is when you’re running/jumping/whatever. How many of you saw UCLA vs. Indiana? What a pleasure to watch two teams wearing uniforms that represent the great traditions of their schools, instead of being whores for Nike! Instead they’re whores to adidas. Just only half joking though, i think the ucla and Indiana jerseys are top-notch, it just annoys me when people focus on swooshification and nike (which i hate as much as anyone) and give adidas (and reebok, which is owned by adidas) a free pass. The padres swinging friar hat on green yesterday looked horrible on tv. It looked like a blob. What is that classified as? Alternate? It’s not on the New Era site? They were this during the season don’t they? That was by far the worst game of the day – it negated the traditional uniform appeal. Iowa…the land I call my home. Sadly, Bishop Heelan lost Saturday night-by kind of a lot. But there’s nothing wrong with second place when you have a rockin’ jersey. This is pretty ironic since pride is a sin. [quote comment=”61251″]The padres swinging friar hat on green yesterday looked horrible on tv. It looked like a blob. What is that classified as? Alternate? It’s not on the New Era site? The only time the swinging friar appears on a regular season Padres hat or jersey is when they wear the blue alternate tops. The swinging friar is on the left sleeve of that jersey. The swinging friar on the hat is a St. Patricks Day only occurance. Aside from the green hat that they wear one time a season on their designated “Military Opening Day” the Padres really only have two game hats, home and road.